President-elect Donald Trump has appointed Republican National Committee communications director Sean Spicer to serve as White House press secretary, Trump's transition team announced Thursday. At the same time, the transition team announced that Trump campaign press secretary Hope Hicks will become director of strategic communications, Jason Miller, a top spokesperson on Trump's presidential campaign, will be director of communications, and Trump social media guru Dan Scavino will be director of social media. "Sean, Hope, Jason and Dan have been key members of my team during the campaign and transition. I am excited they will be leading the team that will communicate my agenda that will Make America Great Again," Trump said in a statement. Spicer, 45, has spent six years as RNC communications director and 15 years in communications for Republicans in Washington. He has well-established relationships with the Washington press corps and is a familiar face on both cable news and the D.C. social circuit. Miller, who has spent two decades in political press relations, was a senior communications advisor to Ted Cruz's presidential campaign before joining Trump for the general election. He also served on Rudy Giuliani's presidential campaign in 2008, and has been a consultant to several Republican congressional campaigns. Hicks, who is just 28, came to the Trump Organization after handling press relations for Ivanka Trump's fashion line. She officially joined the organization in 2014 and served as press secretary on Trump's campaign. As director of strategic communications, she will manage the President-elect's media opportunities. Scavino first met Trump when he was 16 years old, working as a golf caddie. Trump happened to visit the course, which he would later buy, and their conversation eventually led to Scavino becoming general manager of the Trump National Golf Club. Over the years, Scavino became a trusted member of Trump's inner circle, and in February was tapped to direct the Trump campaign's social media operation. For Washington reporters who fear Trump's treatment of the press, Spicer's appointment may be seen as a positive sign. While Spicer can be combative with critics and, like Trump, is known for unleashing his Twitter account on reporters and news organizations, he is also a veteran of the Washington press relations game and likely to provide an open line of communication into Trump's White House. One of Spicer's first tasks will likely be to address concerns that Trump intends to limit media access and do away with the practice of daily press briefings. The Trump transition has long insisted that Trump will uphold the practice, even as his future chief of staff Reince Priebus has hinted at the need for changes. 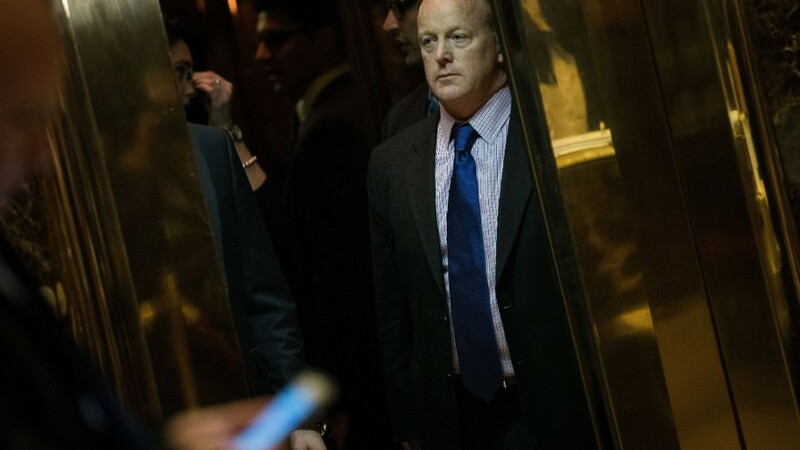 Since Trump became the Republican nominee, Spicer has been one of his staunchest defenders, doggedly sticking up for the billionaire through the campaign and the transition. Last Wednesday, Spicer praised Trump for transparency -- despite Trump's decision to postpone his first press conference as president-elect until January. "What we've seen in government for so often is that people have been shady -- about their roles, hiding things, not releasing things," Spicer said in an interview with CNN's Kate Bolduan. "We have a camera for goodness sake. Every single person who enters Trump Tower, you get to see them go up, go down, they talk to the press." Trump hasn't held a press conference since July. Spicer beat out a number of other candidates who were said to be under consideration for the press secretary role, including conservative pundits Laura Ingraham and Monica Crowley. Last Thursday, the transition announced that Crowley had been appointed senior director of strategic communications for Trump's National Security Council.